More cataloging of junk from Ye Olde Shack of Love. 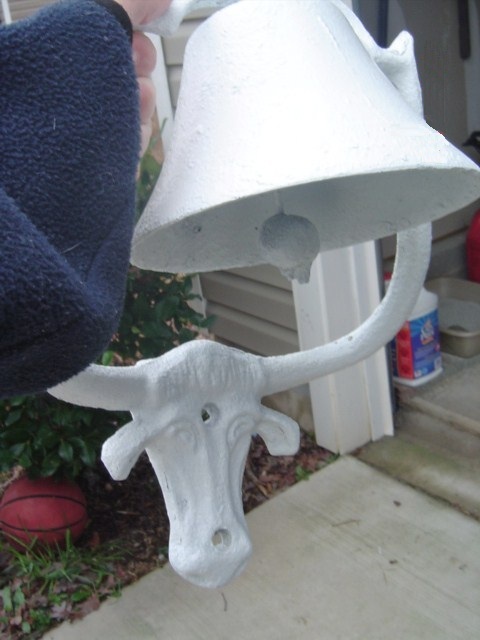 I tore this big cast iron cowbell off the front porch. It was so heavy, I tried to hold it up and take a picture at the same time and it wasn't quite working for me. After dissolving lots of disgusting crud and lead paint, I discovered an extra bolt hole on the steer's head. Perfect for when I bolt this thing onto the new house. It has that perfect iron clang! and I think it might be as old as the shack (1935). He's primed white and ready for a new life. So I was thinking about spray painting him bright orange. Color of the year and all, right? I can't explain why or how much I love that bell. Love, love, love the bell. I have been on the look out for one to hang by my back door to use when it's time to call the boys in. I'm sure they'd love it. . . Awesome, that shack of love is like a treasure chest. What will you find next? shorty had some fine stuff in that old shack of his. accidentally, i'm sure. yes, the world would be a better place if we had more cow bells. or is it a bull bell in your case? either way, i have cow/bull bell envy. Don't be so hard on your pictures. Nikons and watermarked pics are overrated. I'm loving all of shorty's treasures! I love the cow bell, but what I love even more? Is that you posted the "More Cow Bell" bit from SNL. Seriously Katy, if you are ever in Chicago, you need to look me up! The cowbell is perfect and I would LOVE it in orange! Those bells are expensive..that was a great find! Can't wait to see the lot cleared and demo'd!!! woooohooo.